The perfect gift for the Apple fan in your life? 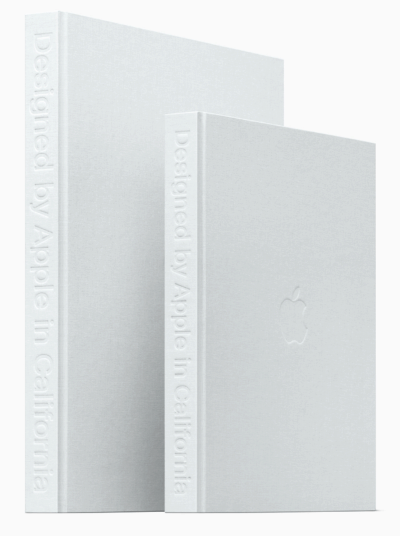 Apple has announced that it will be debuting a new hardbound book, entitled “Designed by Apple in California,” chronicling 20 years of its groundbreaking designs — boasting 450 photographs of past and present Apple products. The book, which is dedicated to the memory of Steve Jobs, will also include exclusive details on the design processes used by Apple’s design team under the leadership of Jony Ive. The photos contained are all shot by photographer Andrew Zuckerman, a filmmaker and photographer who has previously shot portraits of Judi Dench, Clint Eastwood, Ted Kennedy, and others. “Designed by Apple in California” will be available starting tomorrow, available exclusively in select Apple Stores in the U.S., U.K., Australia, France, Germany, Hong Kong, Japan, Korea, and Taiwan. Much like other Apple products, it is available in two sizes — including a small 10.20” x 12.75” edition for $199 and a large version sized at 13” x 16.25” — costing $299. Apple’s new book is as beautifully designed as any of its products. The book marks approximately twenty years since Steve Jobs’ return to Apple in the late 1990s, which began the company’s phenomenal turnaround. It is another piece of evidence in that, under Tim Cook’s leadership, Apple is more willing to pay homage to its past success. This was previously demonstrated by the company’s 30th anniversary celebrations for the Macintosh in 2014 and, more recently, the company’s tribute to the original iBook laptops during Apple’s recent Mac media event. Finally, it’s worth pointing out that this book — by dint of the fact that it begins with 1998’s iMac G3 — is not a study of Apple’s design throughout its lifespan, but only during the (second coming of) Steve Jobs years and beyond. If you’re interested in picking up a book detailing the company’s products from the original Apple 1 through the Macs of the 1990s (and beyond), I’d highly recommend Jonathan Zufi’s 2014 unofficial book Iconic: A Photographic Tribute to Apple Innovation. Between the two, you should be more than covered for all things Apple design!